Philip Mantle has worked on and written for many UFO publications around the world over the last 30 plus years. His very first one was the YUFOS JOURNAL put together by himself, the late Graham Birdsall and his brother Mark Birdsall. YUFOS was of course the Yorkshire UFO Society and its journal was produced on an old printer cranked by hand. Philip explains, "It was hard work at times but the one thing I do remember most is that it was great fun. We all got a great sense of satisfaction from producing it. That very same sense of satisfaction has once again come to the fore with UFO TODAY. Of course the look of it, the production quality and graphics and everything else are worlds away from where I started. But the one thing that is here is the fun, the enjoyment and the great satisfaction that I feel when I see the finished product in front of me. UFO TODAY is a joy to work on. 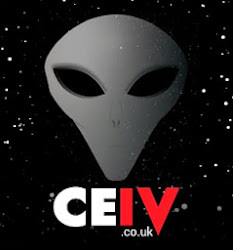 It is a melting pot of ufology and I can only hope that you can feel the sense of satisfaction I have with it and find something within its pages just for you. 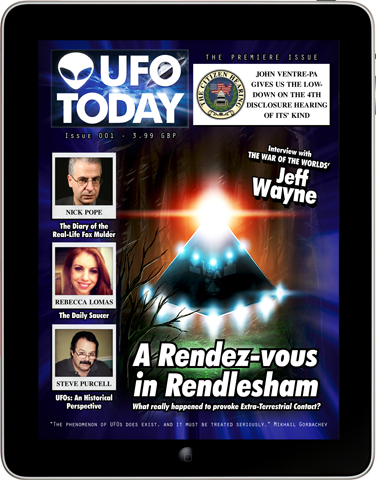 UFO Today Issue 1 features a superb array of articles from around the globe in a fresh and entertaining format never before seen in the UFO community. We have the man from the ministry Nick Pope, Rebecca Lomas's The Daily Saucer,Kevin Goodman, David McNeill, Steve Purcell, Nigel Watson, Brian Allan and some famous encounters like the Rendlesham Forest incident and the Zanfretti Case. Once you have experienced UFO Today, you will be hooked. Available worldwide in PDF Format compatible with Kindle Fire, iOS, Mac, Windows, Android, Blackberry and all good pdf readers. For best results save to your desktop first and upload to your ebook reader in your chosen tablet device. The download is 25mb so be patient! And if you are downloading direct into your tablet browser, remember to wait and open it in your preferred book reader when the download has completed.